Convert your AWD chassis to RWD just like the GT2 and GT3! 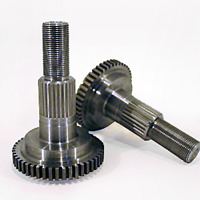 Precision machined front hub spindles that keep the ABS system functioning as designed by the factory. Made of highest quality material to endure the rigors for track and high performance street driving. Eliminate weight from your 996 Turbo or Carrera 4S: The torque tube, front differential / Viscous Coupling and two half shafts with 2 CV joints each are all removed, saving well over a hundred pounds! The GT1 series Porsche 996 Turbo/GT2/C4S Adjustable Upper Rear Control Arms (aka “Dog Bones”) are designed to allow full range adjustment of camber and toe. 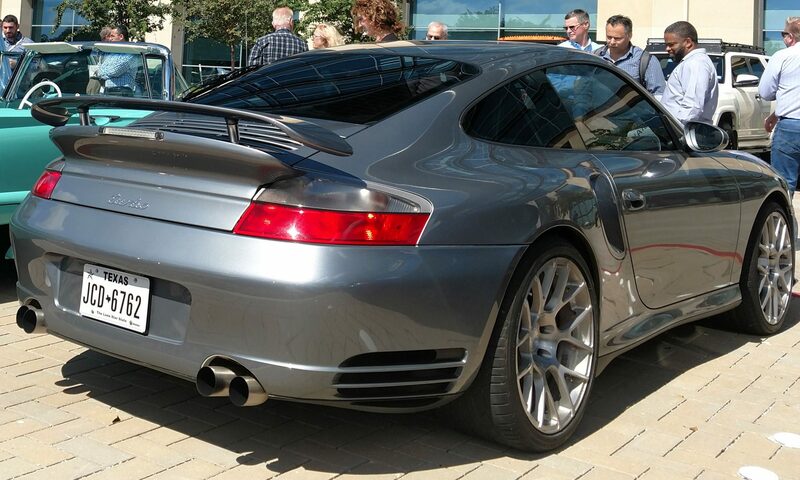 Lowering the 996 wide-body series causes drastic toe and camber changes to the rear track. Some spring kits and coil-over kits put the car below the GT2 ride height, which results in reduction of rear tire contact patch, premature inner tire wear as well as a dramatic changes to thrust angle. The rear of the car feels like it is “dancing around” and might surprise the driver with unexpected snap over-steer. Combine these rear control arms with the billet LCA bushing kit (see below) to tighten up and adjust the rear end for perfect cornering stability and control. Kit includes 4 upper rear control arms. Black Anodized Finish made from billet 7075-T651 aluminum. The GT1 Series Porsche 996 Turbo / GT2 / Carrera 4S Adjustable Rear Toe Links are made from billet 7075-T651 aluminum. Designed to increase the adjustable range over the stock cam style tie rods for correcting thrust angle at the rear of a lowered 996. Correcting the thrust angle aids in high speed stability, better tire wear and results in a much easier car to drive. 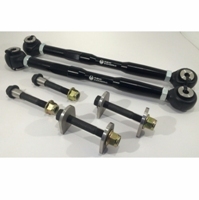 They make a great addition to the lower control arm bushings and rear upper adjustable control arms. Utilizes FK Rod Ends with sealed boots to provide a long lasting kit for all weather conditions. Kit includes 2 arms, toe lock plates and new longer bolts for a complete kit. Less torque steer on uneven roads and better steering feed back from the front wheels which aid the driver on and off the track – ensuring your 996 Turbo / C4S acts as an extension of your direct input. The Lower Control Arm Bushing Kit is made from billet 7075-T651 aluminum, then anodized to ensure these are the toughest LCA bushings on the market. They allow both stock control arm offset and GT3 or motorsport arm offsets. 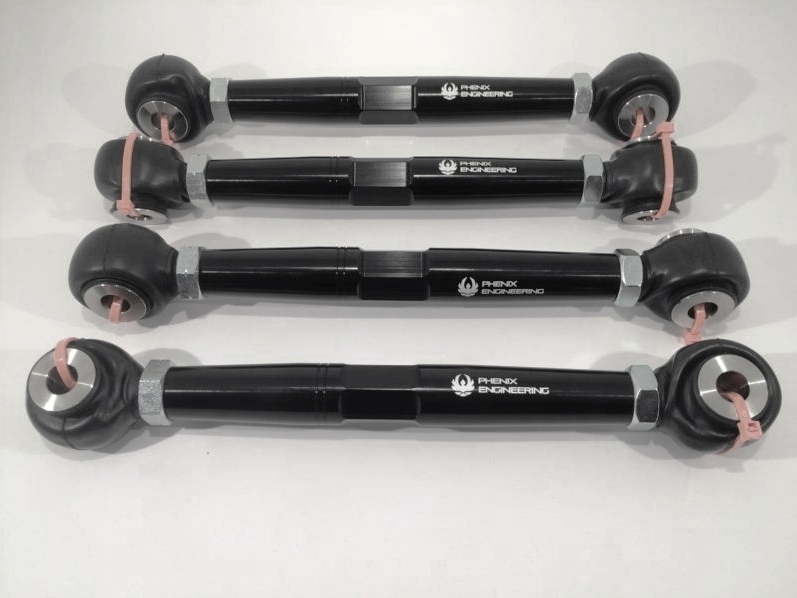 The kit includes 4 bushings for both front and rear lower control arms. 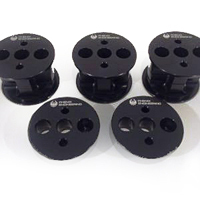 The billet LCA bushings eliminate the deflection commonly found with the stock rubber bushings. Looking for smoother more precise shifter feel? 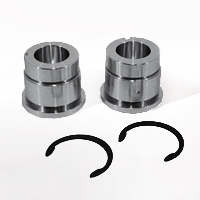 These GT3 style billet shift bushings eliminate deflection and increase driver feed-back to prevent missed shifts. A direct replacement for the factory 996 Turbo / C4S plastic shift bushings. Using an innovative design improving upon the factory GT3 style bushings to allow for easy removal and service. Made from 6061-T6 aluminum.